Winter Wilder | Spring Update! Well, it’s been a while since I’ve updated this blog so I thought I’d write an update on everything that’s been going on. 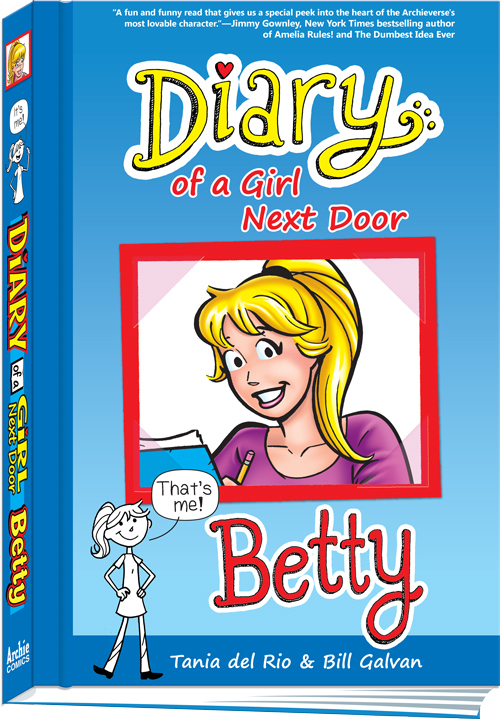 First off, I’m excited to announce that I have a Middle Grade novel coming out in July called DIARY OF A GIRL NEXT DOOR: BETTY, published by Archie Comics as part of their new Riverdale Diaries series! I wrote the story, which is accompanied by wonderful illustrations by Bill Galvan. It’s in the vein of Diary of a Wimpy Kid and all the other funny and charming Diary-style books that have been coming out for middle grade readers. I had a blast with this project and I’m excited to promote it in New York this August as part of Bryant Park’s Word for Word series. More details on that as we get closer! As far as WINTER WILDER goes, I’ve been making progress on that front as well. I was temporarily sidetracked due to a very time-intensive, full-time character design job I had for the last six months. Now that I’m back to my old schedule, I’m putting the focus back on my writing again. My manuscript is juuuuust about ready to send out. But I don’t want to start querying until I’m 110% sure that it’s as tight as it can be. I’m still working on bringing down the word count to a more reasonable level. In the meantime, I’ve had a few beta readers read it to give me their notes. I’ve gotten some good feedback that I’m going to apply before I send it out. Fortunately, most of the notes I’ve received so far are minor, and the consensus is that my story flows well! I’ve also been working on crafting a perfect query letter, which is another behemoth all in itself! A while back I participated in an online query letter workshop with one of my dream agents, Holly Root. She gave me some really encouraging feedback about my query. The one thing she mentioned is that I must find a way to present Winter Wilder in such a way that sets it apart from all the other paranormal that’s already out there. I know this is my most difficult challenge. While I truly believe Winter Wilder is different from any of the other paranormal novels out there, summing up why in just one paragraph is a challenge. In other words, I’m still working on my hook. I also just took another online workshop in conjunction with the Talcott Notch Literary Agency. I was paired with agent Rachael Dugas to fine-tune my first 10 pages, since these are what most agents will be reading in addition to my query. Obviously, I want to make my opening as compelling as possible because I want the agent to request more! I felt very positive overall because Ms.Dugas felt that my writing was very strong, as well as my voice and pacing. Her notes were fairly minor- mostly adding a little more detail here and there, as well as a couple other minor edits. But, after applying her notes, I feel like my opening is extremely solid, and I feel really excited to get querying! You might notice that I’ve removed the sample chapters I had posted here previously. While I’m excited to share my work with the world, I was advised by Ms. Dugas to hold back. Obviously, the internet is a risky place to post anything you don’t want to be potentially plagiarized, and while I don’t believe in operating from a place of paranoia or fear, I think given how much time I’ve spent on this project, it’s prudent to hold off on sharing while I undergo the querying process. If I’m unable to sell the book to either an agent or a publisher, I will look at other options such as posting it online or as an ebook… but we’ll cross that bridge when we get to it! So that’s what’s been going on. Now that my schedule is back to normal I’ll be updating here more often, so stay tuned! just read this, and now find you have removed the chapters. Glad I snuck in before then, but can’t believe it was so long ago. Madness.